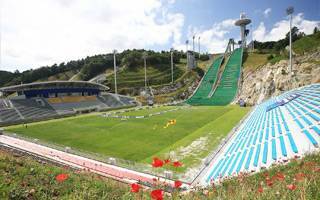 New stadium: For footballers and… ski jumpers! We added a special stadium from North Korea recently, now it’s time for a special one from the southern neighbours. Special for a completely different reason, but you have to admit Pyongyang and Pyeongchang seem similar as you battle with Korean pronunciation. Located charmingly at the heart of Alpensia winter resort, this stadium is a unique case globally. The field of play and seating layout have been planned to satisfy both football and ski jumping. Sure, in Europe we have the example from Finnish Lahti, where a stadium is just beside a ski jump. In Italy there’s even a case where part of the former Olympic ski jump of Cortina d’Ampezzo was transformed into a football field after becoming obsolete. But in this case both uses are literally combined. As a ski jump the building opened in 2009, for the Continental Cup events. From 2017 it’s also expected to host the more prestigious FIS World Cup, while in 2018 the Winter Olympics will be held here. Initially the venue was earmarked for the opening and closing ceremonies, but in the end will only see ski jumping and Nordic combined events. The stadium boasts three stands for 11,000 people (13,500 for ski jumping), with west side opening towards the ski jumping hills. North side is based entirely on hillside, east end partially so, while the main southern stand is a reinforced-concrete structure. It offers extensive infrastructure spreading over 4 floors, including the museum of ski jumping. With the field being located at one of the lowest points throughout the town of Daegwallyeong (700 m above sea level), the stadium offers great conditions for football in the summer. Over the years it hosted numerous youth and friendly events but no professional football. This changed in recent weeks. Gangwon FC of the Korean 2nd league (K-League Challenge) hosted four regular fixtures here in September, becoming the first professional tenant. The team left after yesterday’s Anyang FC victory, but owners of the Alpensia resort assure many more interesting partnerships will follow as the 2018 Olympic venues are expected to prove their lasting legacy and avoid the white elephant effect, not uncommon in South Korea.